With the sharp increase in the numbers of tattoo studios across the world to satisfy the ever increasing demand, it naturally follows that there will be a corresponding increase in the number of clinics, dermatologists – and not a few charlatans – offering their services and products to remove unwanted tattoos. Why do so many people want to remove what they must have known was a life-long commitment to their bodies? Unless you have been living on another planet, you would surely have been aware that just like buying a puppy, a tattoo is for life; not just for Christmas, and is not something that can easily be discarded, once you grow tired of it. Surely most people would realize that getting a tattoo and is not something they should do on a whim – just to impress their friends, or as a sign of undying love to their latest bed partner or maybe their latest pop idol. Yet the facts speak for themselves. A recent survey indicates that almost 25% of the US adult population are the proud owners of a tattoo somewhere on their bodies, but that up to 50% of tattoo bearers would like to remove at least one of them. Why the growing clamor for tattoo removal? Let’s look at some of the most common reasons for wanting a tattoo removed. “The tattoo has been done badly. People claiming expertise in tattoo removal have been around as long as the ancient art itself. Early methods involved the injection of wine, lime, garlic or even pigeon excrement into the skin! To what extent these ancient techniques were effective is not clear, but there is little doubt that the tattoos were never completely removed and the recipient’s skin was never returned to its former virginal state. “Dermabrasion” – A procedure that uses trichloroacetic acid to remove the top layers of skin, some of which also seeps deeply into the layer where the tattoo ink resides. “Salabrasion” – This process involves scrubbing the skin using gauze pads saturated with salt to abrade the area of the tattoo. “Cryosurgery and Excision” – A procedure involving the use of extremely cold temperatures to destroy the skin tissue and then remove it surgically. This method is still sometimes used for larger tattoos, along with skin grafts with both techniques involving major operations. As you can imagine, the above procedures are controversial, often extremely painful, and in extreme cases can even be life threatening. They take months to carry out and the results are far from satisfactory. Invariably, such treatments leave scars that are worse than the offending tattoo being removed. Then along came laser therapy. Initially, laser treatment was carried out using “continuous-wave lasers”, so-called because the power output is constant. In the 1990s the treatment changed to using “Q-switched lasers”, which produce a pulsed output beam. With its extremely high peak power, Q-switched lasers are more effective in removing the offending inks. The way it works is that lasers break up the pigment colors with a high-intensity beam. Black and darker colors are the easiest to treat as they are vulnerable to all lasers, whereas other colors can only be removed by using selected lasers based on the pigment color. The number of treatments required will vary according to the size, the color, the age and ‘type’ – i.e. amateur or professional, superficial, deep lying, and so on. The offending tattoo may need anything from two to ten separate treatment sessions for complete removal, although most tattoos should not need more than four visits. Sessions should be scheduled about six to seven weeks apart, as having treatments too close together will increase the risk of scarring. When you have selected your chosen clinic you will have an initial consultation with a physician, who will examine your tattoo and estimate on the number of treatments necessary. Then the treatment sessions commence – with each one lasting anything from 15 to 45 minutes. At the start of your first session, you will be given an eyeshade to protect you from the lasers, and your skin will be tested to check the level of power suitable for your skin. A hand-held laser instrument is then placed against your skin and the treatment commences. Each pulse of the laser feels like the ‘slap’ of a rubber band against the skin. After each session, the area will be treated with an ice pack and you will be given antibiotic cream to apply and also a bandage or patch to protect the exposed site. There are several Laser Removal clinics advertising their services in Bangkok and prices vary considerably. If you are going to go this route we would urge you to check reviews and to stick with clinics that are part of a major hospital group who are likely to have international accreditations and the latest equipment. Different people experience different levels of pain, and most say it is a relatively mild and tolerable process. There are even some who claim that a visit to their hairdresser has been a more painful experience! While some describe the pain as a rubber band slapping against the skin, others say it feels like a rapid series of skin pricks. The level of pain will also depend on the location of the tattoo – whether it is located in a ‘fatty’ area, or if it’s close to the bone which will be more painful. Anesthetic creams are sometimes applied in particularly sensitive areas. Yes, it is, provided you go to a fully qualified, reputable dermatologist or a cosmetic surgery. If in doubt, your family doctor or GP should be able to recommend one for you. Choose carefully as this is not something you want to rush into by responding to the first special offer of ‘buy one get one free’ you see on Google. The risks and side effects are minimal, the main one being the danger from infection, but provided you go to a reputable clinic that has fully qualified and experienced clinicians and you follow their instructions carefully, the infection risks are negligible. 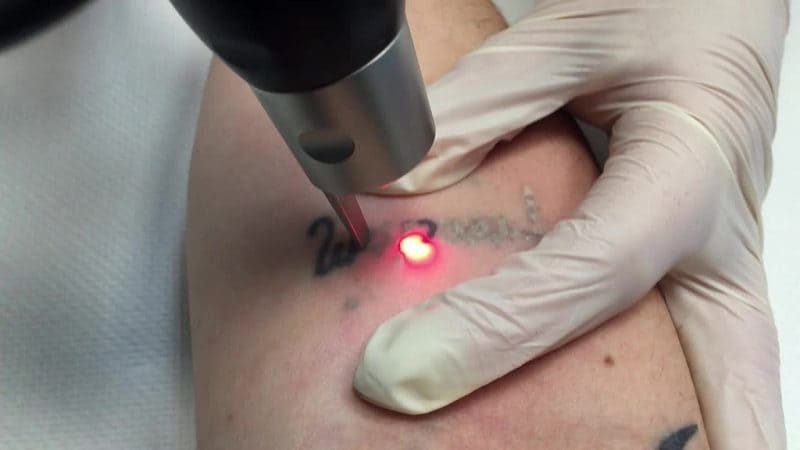 There will always be a slight possibility of a scar, and you may end up with the patch of skin where the tattoo once existed being slightly lighter – or darker – than the surrounding skin. If you have been experiencing an allergic reaction to your tattoo, then you may experience an allergic reaction during the removal process, but any such reactions are treatable, usually with creams such as Benadryl. Wouldn’t it be just great if there was a magic cream that would really remove your unsightly or unwanted tattoo? For sure, if you search the internet you will find many companies that claim that such a cream really does exist. Who knows? – one day it might, but for now, there is absolutely no doubt that any company that lays claim to a cream which will achieve 100% successful tattoo removal is lying through its corporate teeth. The fact is that tattoo ink has been injected deeply into the layers of your skin to ensure that it does not fade away with the normal shedding of your skin. So far, there is no cream that can successfully penetrate these layers and properly tackle the ink. Some creams have been known to fade tattoos, but none can remove them completely. These creams work by bleaching the skin – in much the same way as darker skinned women often use skin creams to lighten their skin. These bleach-like substances can leak through to the surface of the tattoo inks and can cause them to fade slightly. But even to achieve a slight fading, you will have to work on your skin over a long period of time. Also, bear in mind that these creams contain corrosive chemicals and that extensive use of them can often lead to skin irritations and even more serious problems. By far the best policy is to never have a tattoo on your body that one day you might regret. Never have tattoos in a hurry – as just like puppies, you will have to live with them for the rest of your life. Remember, tattoo removal is a long, expensive and sometimes painful experience. How can All Day Tattoo Help? The chances of you having a tattoo that one day you might regret will be much reduced if you visit a reputable tattoo studio such as All Day Tattoo based in Bangkok, Thailand. Our free consultation service will ensure that you will end up with a tattoo that you will be more than happy to keep on your body for the rest of your life. We at All Day Tattoo have a highly ethical approach to our work and we will go through every aspect of your planned tattoo with you, and make sure you have thought about all the possible implications before you give us the go-ahead to start work. If you have made up our mind that your unloved tattoo must go, maybe you should consider the idea of a ‘cover-up’ tattoo. Our skilled artists at All Day Tattoo will be eager to discuss possible designs for a tattoo that will change the appearance of your unwanted design. We may be able to transform it into something that you will be happy to have on your skin. So whether you want to have your very first tattoo – one that you will not regret having later in life, or if you would like to discuss the designing of a cover-up tattoo that will turn something of distaste into a new beautiful work of art, then why not click the button below?